The word “Eucharist” originates from the Greek language, and literally means “thanksgiving”. 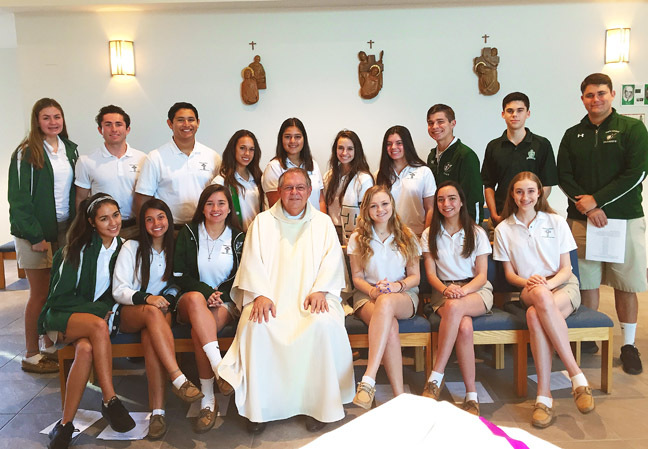 And so we give thanks for the sixteen members of the TC Campus Ministry team who will serve the TC worshipping community as Extraordinary Ministers of Holy Communion at our school Masses. Fr. Mike Muhr, pastor of St. Lawrence Church, performed the commissioning ceremony at a recent morning Mass in our Blessed Edmund Rice Chapel. The names of those who will be distributing Holy Communion at our TC Masses are as follows: Maya Berro, Mira Bisesi, Wade Brogno, Bianca Falcone, Logan Foster, Patrick Friscia, Lexi Girard, Jenarose Hodge, Isabella Meza, Mia Mudano, Katherine O'Neal, Emily Pope, Marianna Porras, Rafael Soto, Natalya Thomas, and Ethan Zeiger.